Lemon juice is widely touted as an all-natural, simple, and inexpensive treatment for acne and acne scars. But does it really work? Before you start using lemon on your skin, let's take a look at what the science says. Lemon juice has traditionally been used as an acne treatment in herbal-based medicine. 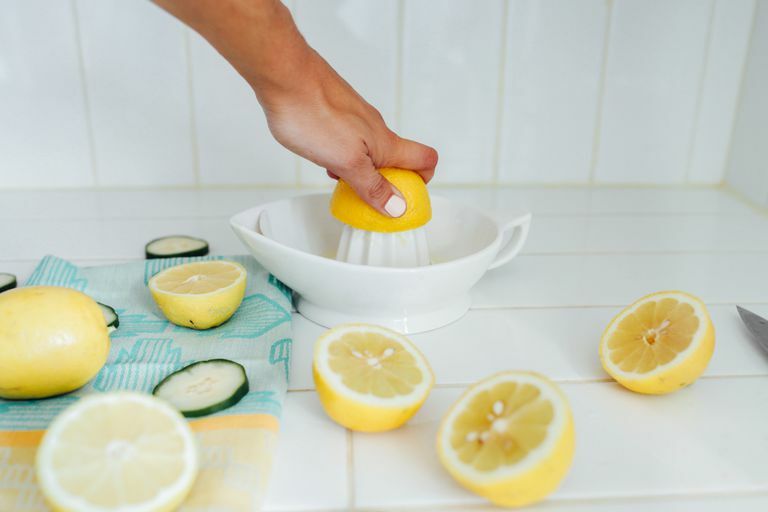 And plenty of beauty blogs, mags, and nature-inspired DIY skin care recipes today continue to extol the benefits of lemon juice for acne and acne scars. So much so that I hate to go against the grain, but there is no evidence I could find that supports the idea that lemon juice clears pimples or scarring. Lemon juice does have qualities that make it seem to be a good skin care treatment. It's mildly astringent, so it may help to reduce oiliness. It's also antibacterial, mainly because it creates an acidic environment that bacteria don't like. Having antibacterial qualities alone isn't enough to clear up acne, though. Human skin is naturally slightly acidic, with a pH between 4.5 and 5.5. Lemon juice is a much stronger acid, with a pH of about 2. Although that doesn't sound like a huge difference, it is when you consider that with each step down in the pH scale, the acidity increases by 10. So, lemon juice is not just two times more acidic, but actually 100 times more acidic than the skin. So there's no doubt that lemon juice will sting (immensely so) when you dab it on a pimple, especially one you've picked at. But did you know that, because of lemon juice's low pH, it can cause chemical burns? Even if it doesn't burn your skin it could cause contact dermatitis, an itchy rash that develops when your skin is exposed to an irritant. Just because a substance like lemon juice is natural isn't an automatic guarantee that it's safe for the skin. Remember, poison ivy is also natural but you wouldn't want to rub that on your skin. Another interesting factoid for you: lemon juice, and all citrus fruits for that matter, can make your skin more sensitive to the sun. So if you apply it to your skin and head outdoors, you could get a nasty sunburn. Lemon juice doesn't have the market cornered on this issue, though. There are many conventional acne medications that cause sun sensitivity as well. Citrus can also trigger a severe type of rash called phytophotodermatitis. Phyto- means plant, photo- light, derma- skin, and -itis means inflammation. Put it all together and phytophotodermatitis means "skin irritation caused by plants and light." The plant, in this case, could be lemon. Lemons (and certain other fruits, vegetables, and plants) contain furocoumarins. These compounds are harmless on their own, but watch out when you mix them with sunlight. Furocoumarins, when exposed to sunlight, trigger damage to cell DNA. This can cause a severe burn-like rash. And even sunblock won't completely protect you from this malady, though it can reduce it a bit. Phytophotodermatitis is also called "lime disease" (as a play on the more commonly known and completely unrelated Lyme disease) or "margarita rash" because it's often triggered by lime juice. But any citrus fruit can cause phytophotodermatitis, as can other fruits, carrot, certain essential oils, and even grasses and weeds. Knowing this, great care should be taken to steer clear of the sun if you decide to use lemon juice on your skin. Lemons do have plenty of benefits for your skin, but maybe not in the way that you initially thought. One of the best things lemons have going for them is their high vitamin C content. Vitamin C, also called ascorbic acid, is used in many skin care products. Vitamin C is a fabulous anti-aging and antioxidant ingredient. It helps fight free radicals, brighten the skin, and curb wrinkles. It is also an important vitamin that helps us create collagen, which is the protein that helps build strong, healthy skin. Topical application of lemon juice isn't the best way to deliver vitamin C to the skin, though. The ascorbic acid in skin care products is buffered with other ingredients, so it won't be as irritating to the skin as straight lemon juice can. Instead of applying it to your skin, drink lemon juice instead. Drinking water with a squeeze or two of fresh lemon is a much better way to incorporate the skin benefits of lemon into your daily routine. Drinking citrus juices also gives you those anti-aging effects. Citrus juices help reduce cell damage when they're ingested, so there's no need to slather on your skin. Some studies have shown that taking citrus orally may decrease wrinkle formation and increase collagen. Others suggest that drinking citrus juices may give a protective effect against certain types of skin cancer. Unfortunately, though, there's no indication that drinking lemon juice has any effect on acne. Lemons also contain citric acid. Citric acid is not vitamin C. It actually belongs to a group called alpha hydroxy acids (AHAs). Like vitamin C, alpha hydroxy acids are common skin care ingredients. They're used to exfoliate the skin, dissolve away dead skin cells, and leave the skin feeling smooth and looking bright. But again, the alpha hydroxy acids in skin care products are carefully balanced to give your skin an effective, but safe, treatment. Lemon juice can exfoliate your skin too, as an at-home DIY mini peel. But it can also be super aggressive so take care. It can cause dryness, irritation or even peeling, especially if you use lemon juice on your face often. So, we know lemon isn't a proven acne treatment. But what about treatment for acne scars? Unfortunately, lemon juice can't get rid of depressed or pitted acne scars, nor will it flatten raised scars. All of these types of scars are actually very difficult to treat. To see a marked improvement of these scars, you'll need to have professional scar treatment procedures done by your dermatologist or plastic surgeon. Lemon juice is a common folk remedy for fading post-inflammatory hyperpigmentation (PIH), those dark marks that remain after pimples heal. Although there is no evidence for lemon juice itself, alpha hydroxy acids—because they speed up cell renewal—have been shown to lighten PIH. But the AHAs found in lemon juice are generally much lower than you would find in even over-the-counter alpha hydroxy acid products. So lemon juice will be less effective at clearing up dark spots than an alpha hydroxy acid. Another caveat: If the lemon juice irritates your skin it can actually cause the very dark spots you're trying to lighten. So go easy or avoid putting lemon juice on the skin altogether, especially if you're prone to developing dark spots after pimples or other wounds heal. Never use lemon juice if you have sensitive skin. It could very easily irritate your skin, so why tempt fate? Use those slices of lemon in your water instead. Stay out of the sun. Always wash off thoroughly before going outside, and know that it can make you more susceptible to sunburn even after you've washed it off. It may be a good idea to apply at night. Mix lemon juice with another ingredient rather than apply directly to the skin. This can help buffer the juice so it isn't quite so aggressive on the skin. I'd suggest mixing with yogurt, oatmeal, honey, or even just dilute with water. Don't leave it on your skin for too long. Remember, this stuff is strong. Just a few minutes, certainly no more than 5, will do. No, don't sleep in it (despite what some suggest). Only use occasionally. A few times a month is probably fine, every day is not. Use too often and you'll definitely end up with dry, irritated, and possibly peeling skin. Don't use on deep blemishes. If you're using as a spot treatment, remember to only use on superficial zits and rinse off after a couple of minutes. Don't apply to larger, deeper blemishes. You'll most likely just irritate it further and it won't heal any faster. Stop using immediately if you notice any sort of irritation or rash. And you'll want to give your doctor a call if the irritation is severe or lasts longer than a day or so. Truly, if you're looking for a way to get rid of acne your best bet is with proven acne treatment medications. No, it's not an all-natural way to treat acne, but it is the most effective way. Over-the-counter acne medications, especially those containing benzoyl peroxide, are great for mild cases of acne and/or blackheads. If your acne is more stubborn, widespread, or inflamed, you'll benefit from prescription acne medications. With anything though, it's important to give the medication time to work. It will more than likely take 3 to 4 months before you notice improvement of your acne, so stick with it. Kim DB, Shin GH, Kim JM, Kim YH, Lee JH, et. al. "Antioxidant and Anti-Ageing Activities of Citrus-Based Juice Mixture." Food Chemistry. 2016 Mar;194:920-7. Zou Z, Xi W, Hu Y, Nie C, Zhou Z. "Antioxidant Activity of Citrus Fruits." Food Chemistry. 2016 Apr 1;196:885-96.